Every day, wherever we go, we are exposed to minute amounts of environmental radiation. * This environmental radiation is emitted continuously, day and night, from various objects and substances in the natural world and our living environment. Most environmental radiation consists of three types: alpha rays (α), beta rays (β) and gamma rays (γ). 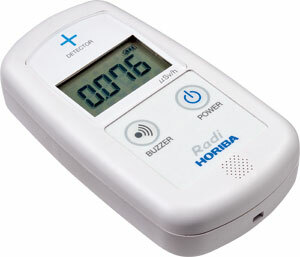 HORIBA&apos;s PA–1000 "Radi" environmental radiation monitor makes it easy for non–specialists to measure even minute levels of gamma rays. High performance detection with a CsI (Tl) scintillator The Radi can measure radiation levels ranging from normal natural radiation to levels 100 to 200 times that intensity. Even non–specialists will find it easy to measure radiation of 0.001 – 9.999 μSv⁄h. * Relative sensitivity with 1 as the sensitivity to cesium 137 (662 keV). Note: This unit is designed only to measure the quantity of radiation at the measurement location. It does not determine the safety or danger posed by that quantity of radiation.